Adele may have spent last year recovering from throat surgery but the singer and songwriter scooped six Grammy Awards - so Lady Gaga had to give credit where it's due! The 23-year-old singer sensation, Adele, went away from the Grammy Awards with no fewer than six awards - the star won in every category she was nominated for. 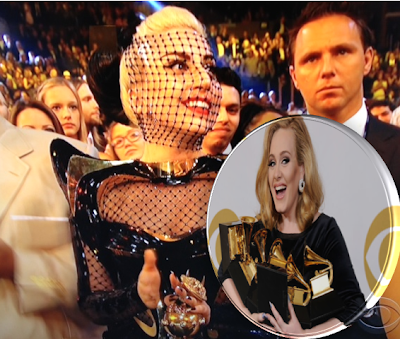 Lady Gaga went away from the awards empty handed whereas Adele picked up awards galore. Her Grammy Awards included best song with Rolling in The Deep, best pop solo performance with Someone Like You, best pop vocal album and best album for 21 (one of our faves) as we;; as record of the year with Rolling in The Deep and best short-form music video award for the same song. Lady Gaga didn't think Adele had quite been given enough prizes and tweeted out: "What a beautiful night last night was, Adele deserved every award she won and perhaps an extra one for being such a kind and lovely woman. "Adele was pretty chuffed with her awards too and looked overwhelmed at times. The emotional vocal powerhouse has also decided to change tack with her song writing and has said that she is "done" with sad songs.